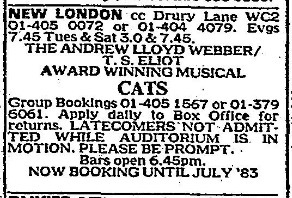 (from Wikipedia) Cats premiered in the West End at the New London Theatre on 11 May 1981. There was trouble initially as Judi Dench, cast in the role of Grizabella, snapped her achilles tendon during rehearsals prior to the London opening. The role of Grizabella was subsequently taken over by Elaine Paige, who only had 3 days of rehearsal before beginning previews. The role was beefed up for Paige and the song “Memory” (originally to be sung by Geraldine Gardner in the role of the red cat Bombalurina) was given to Paige. The musical was produced by Cameron Mackintosh and Lloyd Webber’s Really Useful Group, directed by Trevor Nunn, with associate director and choreographer Gillian Lynne, design by John Napier, and lighting by David Hersey. It played a total of 8,949 performances in London. Its final performance in London’s West End was on its 21st birthday, 11 May 2002, and broadcast on a large screen in Covent Garden to the delight of fans who could not acquire a ticket for the final performance. It held the record as London’s longest running musical until 8 October 2006, when it was surpassed by Les Misérables. The front section of stalls seating was built onto the revolve that was part of the New London Theatre, and patrons seated in that section entered via the stage, and took their seats facing downstage. The auditorium was revolved into it’s correct position during the overture, revealing the set to the rest of the audience. It led to the wonderfully enticing newspaper advert shown left, warning that ‘Latecomers not admitted while auditorium is in motion’. Who could resist! The show made its debut on Broadway on 8 October 1982, at the Winter Garden Theatre with the same production team. On 19 June 1997, Cats became the longest-running musical in Broadway history with 6,138 performances. It closed on 10 September 2000, after a total of 7,485 performances. Its Broadway record was surpassed on 9 January 2006 by The Phantom of the Opera. It remains Broadway’s second longest-running show in history. Lloyd Webber stated that when the original show was produced, it cost £900,000, but on Broadway, it cost $5,000,000. In 1998, Lloyd Webber produced a video version of Cats, based upon the stage version, starring Elaine Paige, who originated the role of Grizabella in London; Ken Page, who originated Old Deuteronomy on Broadway; Sir John Mills as Gus; Michael Gruber as Munkustrap; John Partridge as The Rum Tum Tugger; Jo Gibb as Rumpelteazer with many of the dancers and singers drawn largely from various stage productions of the show. It was directed by David Mallet, with choreography and musical staging by the show’s respected original creator Gillian Lynne in London’s Adelphi Theatre, and was released on VHS and DVD, as well as broadcast on television worldwide. Andrew Lloyd Webber and others on the production team for the film wanted to keep the feeling that viewers watching the film could still get the sense of seeing the show live, by having all views be facing the stage, therefore, getting multiple views of the set, with several close-ups. Beyond the productions in England, the U.S., Canada, and Australia, the musical has been produced professionally in Hungary, Austria, and Japan, 1983; Sydney and Toronto, 1985; Germany, 1986; France, 1989; Mexico, 1991; Netherlands, 1992; Argentina, 1993; Hong Kong, 1994; Spain, 2003; Poland and Czech Republic, 2004; Russia and Estonia, 2005; Israel, Taiwan, Thailand, South Korea, China and Finland, 2007; Singapore, Hong Kong, Dominican Republic, Norway, Sweden, South Africa, China, Italy, Bulgaria and Japan, 2009; and Brazil and the Philippines, 2010. Cats has been translated into over 20 languages. The lighting plan by David Hersey can be viewed on the Backstage Heritage Collection.